counterbalance of color, energy and hope. We are pregnant again! Alexander has a little brother or sister currently growing in my tummy right now. We had our first appointment today, and baby Olive is doing fine, measuring at 9 weeks and 3 days with a heart rate of 172 beats per min. 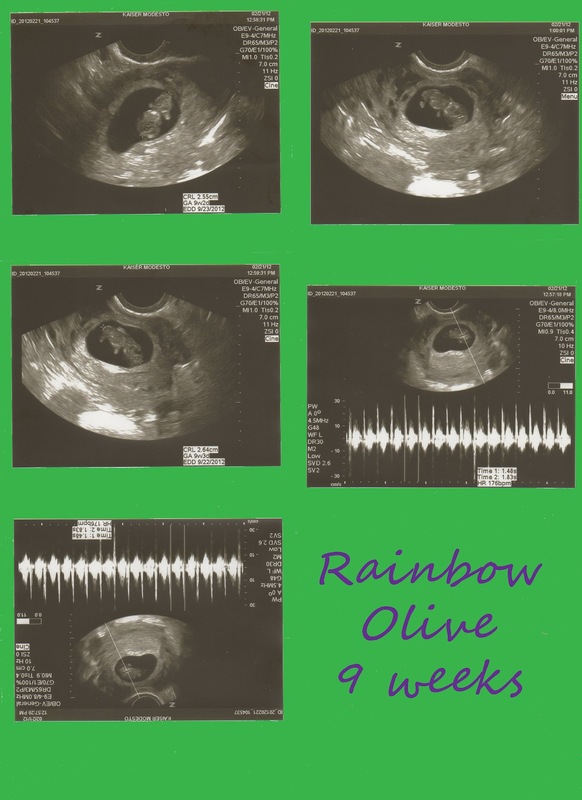 We are calling the baby Olive. We started calling the baby by whatever my phone app said it was the size of in a given week, blueberry, raspberry, olive, etc. Well this week the baby is the size of a prune and I refuse to call a child a prune. Also the letters in Olive can be rearranged to "I love" and has the word "live" in it. So until we know this baby's gender its name is Olive. I'll admit I've been pretty anxious, especially the last few days. I now know pregnancy doesn't always end with a baby coming home and its scary. Alexander's birthday just passed with all the emotions and memories along with it and I have pregnancy hormones in my system. I've already been so emotional missing Alexander while having cautious hope and joy for Olive. But ultimately it is out of my control. This child, like every child on this planet belongs to God. Olive is God's baby. I'm hoping that God's plan is for Olive to be born and grow up to do work on earth, but I know that no matter what Olive's future is I already love this little life growing inside me. You can see Olive's head and body and little limb buds. I love the top left picture where it looks like Olive is waving. Olive isn't a replacement for Alexander but a new addition to this little family of mine. I do and always will miss my baby boy. He's a big brother now and I know that thrills him to pieces. We are a family of 4 now, three on earth one in heaven. I will cherish all the time I have with you sweet baby Olive.